The effect has been predicted theoretically decades ago – but it is very hard to provide experimental evidence for it: "Superradiance" is the phenomenon of one atom giving off energy in the form of light and causing a large number of other atoms in its immediate vicinity to emit energy as well at the same time. This creates a short, intense flash of light. Up until now, this phenomenon could only be studied with free atoms (and with the use of special symmetries). Now, at TU Wien (Vienna), it was measured in a solid-state system. The team used nitrogen atoms, built into tiny diamonds that can be coupled with microwave radiation. The results have now been published in the journal Nature Physics. According to the laws of quantum physics, atoms can be in different states. "When the atom absorbs energy, it is shifted into a so-called excited state. When it returns to a lower energy state, the energy is released again in the form of a photon. This usually happens randomly, at completely unpredictable points in time," says Johannes Majer, research group leader at the Institute of Atomic and Subatomic Physics (TU Wien). However, if several atoms are located close to each other, an interesting quantum effect can occur: one of the atoms emits a photon (spontaneously and randomly), thereby affecting all other excited atoms in its neighborhood. Many of them release their excess energy at the same moment, producing an intense flash of quantum light. This phenomenon is called "superradiance". "Unfortunately, this effect cannot be directly observed with ordinary atoms," says Andreas Angerer, first author of the study. "Super radiance is only possible if you place all the atoms in an area that is significantly smaller than the wavelength of the photons." So you would have to focus the atoms to less than 100 nanometers – and then, the interactions between the atoms would be so strong that the effect would no longer be possible. 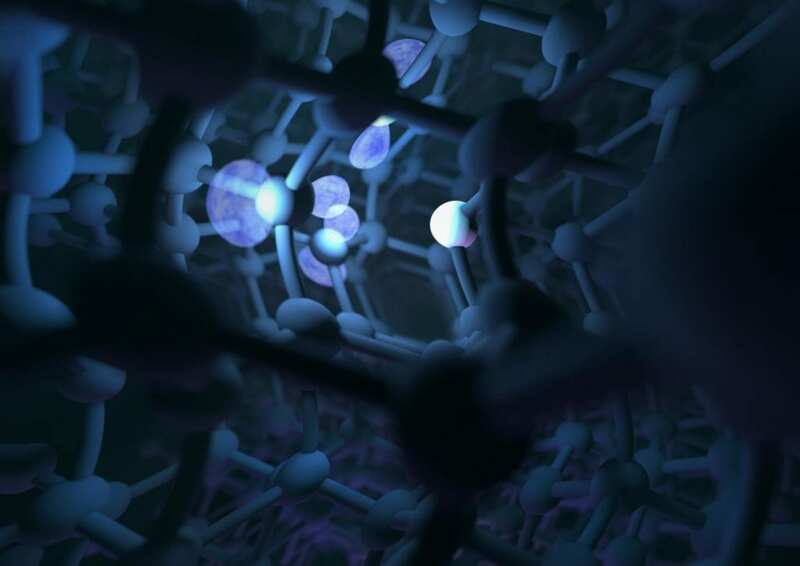 One solution to this problem is using a quantum system that Majer and his team have been researching for years: tiny defects built into diamonds. While ordinary diamonds consist of a regular grid of carbon atoms, lattice defects have been deliberately incorporated into the diamonds in Majer's lab. At certain points, instead of a carbon atom, there is a nitrogen atom, and the adjacent point in the diamond lattice is unoccupied. These special diamonds with lattice defects were made in Japan by Junichi Isoya and his team at the University of Tsukuba. They have succeeded in producing the world's highest concentration of these desired defects without causing any other damage. The theoretical basis of the effect was developed by Kae Nemoto (National Institute of Informatics) and William Munro (NTT Basic Research Laboratories) in Tokyo, Japan. Just like ordinary atoms, these diamond defects can also be switched into an excited state – but this is achieved with photons in the microwave range, with a very large wavelength. "Our system has the decisive advantage that we can work with electromagnetic radiation that has a wavelength of several centimeters – so it is no problem to concentrate the individual defect sites within the radius of one wavelength," explains Andreas Angerer. When many diamond defects are switched to an excited state, it can usually take hours for all of them to return to the lower-energy state. Due to the superradiance effect, however, this happens within about 100 nanoseconds. The first photon that is sent out spontaneously causes all other defect sites to emit photons as well. Superradiance is based on the same basic principle as the laser – in both cases there is a stimulated emission of photons, triggered by a photon hitting energetically excited atoms. Nevertheless, these are two quite different phenomena: In the laser, a permanent background of many photons is needed, constantly stimulating new atoms. In superradiance, a single photon triggers a flash of light all by itself. "In a sense, superradiance is the more interesting effect, from a quantum physics point of view", says Johannes Majer. "Today, many novel quantum effects are studied, in which the entanglement of many particles plays an important role. Superradiance is one of them. I expect that this will lead to something new, which we might call Quantum Technology 2.0 in the next few decades."